John Nahra is a senior partner with Baker, Keener & Nahra, coming to the firm from his hometown of Lynwood, California. John has brought numerous cases to trial over the last thirty years, achieving excellent results for his clients in a wide variety of disputes. His hands-on approach and fine eye for detail with respect to every phase of his cases has allowed him to quickly identify problems and go to bat for his clients to defend their interests, no matter how difficult or unpopular their case may be. As a result, John enjoys a strong professional reputation in Southern California and is commonly asked to speak on topics involving trial techniques, professional liability and risk management. 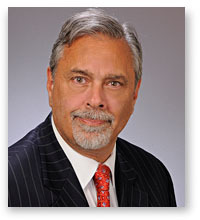 His practice includes business litigation on behalf of both plaintiffs and defendants, professional liability defense on behalf of both medical and legal professionals and the institutions and organizations that employ them, and providing advice and consultation to clients and carriers with regard to risk management. In addition to his role as a litigator, John served as a mediator with the Los Angeles Superior Court and currently serves as a panel mediator for the United States District Court, Central District, where he uses his years of experience to bring parties together to resolve their disputes. Reflecting his many years of trial experience, John is an associate member of the American Board of Trial Advocates in addition to his membership with the Southern California Association for Healthcare Risk Management, the Professional Liability Defense Federation and the Litigation Counsel of America as a Senior Fellow. While not practicing law or spending time with his family, John can be found enjoying a game of golf or strumming away at his favorite songs on guitar. A true Southern Californian at heart, John can also be found surfing the waves at the local beaches.